Brief: For years Google used Goobuntu, an in-house, Ubuntu-based operating system. Goobuntu is now being replaced by gLinux, which is based on Debian Testing. If you have read Ubuntu facts, you probably already know that Google uses a Linux distribution called Goobuntu as the development platform. It is a custom Linux distribution based on…(easy to guess)… Ubuntu. Goobuntu is basically a “light skin over standard Ubuntu“. It is based on the LTS releases of Ubuntu. If you think that Google contributes to the testing or development of Ubuntu, you are wrong. Google is simply a paying customer for Canonical’s Ubuntu Advantage Program. Canonical is the parent company behind Ubuntu. After more than five years with Ubuntu, Google is replacing Goobuntu with gLinux, a Linux distribution based on Debian Testing release. As MuyLinux reports, gLinux is being built from the source code of the packages and Google introduces its own changes to it. The changes will also be contributed to the upstream. This ‘news’ is not really new. It was announced in Debconf’17 in August last year. Somehow the story did not get the attention it deserves. You can watch the presentation in Debconf video here. The gLinux presentation starts around 12:00. Once Google opted Ubuntu LTS for stability. Now it is moving to Debian testing branch for timely testing the packages. But it is not clear why Google decided to switch to Debian from Ubuntu. How does Google plan to move to Debian Testing? The current Debian Testing release is upcoming Debian 10 Buster. Google has developed an internal tool to migrate the existing systems from Ubuntu 14.04 LTS to Debian 10 Buster. Project leader Margarita claimed in the Debconf talk that tool was tested to be working fine. Google also plans to send the changes to Debian Upstream and hence contributing to its development. Ubuntu loses a big customer! Back in 2012, Canonical had clarified that Google is not their largest business desktop customer. However, it is safe to say that Google was a big customer for them. As Google prepares to switch to Debian, this will surely result in revenue loss for Canonical. Do keep in mind that Google doesn’t restrict its developers from using any operating system. However, use of Linux is encouraged. 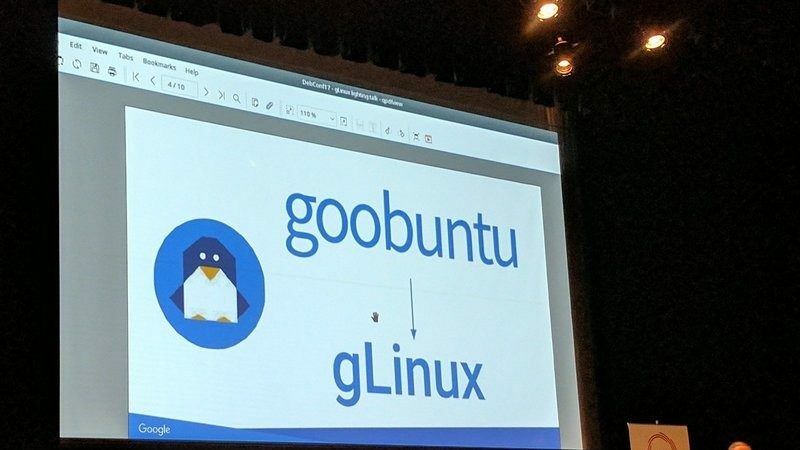 If you are thinking that you can get your hands on either of Goobuntu or gLinux, you’ll have to get a job at Google. It is an internal project of Google and is not accessible to the general public. Overall, it is a good news for Debian, especially if they get changes to upstream. Cannot say the same for Ubuntu though. I have contacted Canonical for a comment but have got no response so far. Update: Canonical responded that they “don’t share details of relationships with individual customers” and hence they cannot provide details about revenue and any other such details. What are your views on Google ditching Ubuntu for Debian? Debian first got on my radar when I started using the Chinese distro Deepin three years ago. I really liked it and still use Deepin 15.8 as a daily driver on one of my systems. Because of Deepin, I began checking out Debian proper. I never looked back. Ubuntu was the right distribution for me when I first made the switch because of its simplicity. Plus, Ubuntu does quite a lot for you. In fact, I was not aware of just how much until I moved to other pastures. Debian requires more of the user and is a bit less suitable for beginners. In return, Debian is a faster, more responsive system with rock-solid stability. Since Ubuntu is Debian based it remains familiar and mostly compatible with anything Ubuntu. I have also found Ubuntu to be quite buggy at times and upgrading to new point releases often resulted in a broken system. This was especially true of Kubuntu. I often felt the point release upgrades only became an upgrade shortly before the new point release was due for release. Some releases were close to perfect but gave way to a buggy mess of a release on the next go around. Debian has been a joy. I have used all the available desktop environments with Debian and the result is always stable. Even the testing branch has been great. I have never had many issues with upgrades and Debian can be configured in seemingly infinite ways. Google probably experienced all the same problems I encountered with Ubuntu and decided they had enough. Debian will be an easy transition and a good one. I believe Google’s move will really benefit Debian Upstream and in turn benefit everyone using Linux. Disclaimer – I am a Debian fanboy, have been using Debian for last 10+ years, have written articles about Debian on itsfoss.com, my blog and elsewhere and also have been to one Debconf, Debconf 2016 which was sponsored by Debian. I was a Ubuntu User till 2006/2007 when Ubuntu started started making changes which I didn’t like and then moved to Debian. More importantly though, I saw that Debian is more responsive and kinder to users than Ubuntu ever was. Even if you were to file a bug which again takes some doing and initiative, the standard response most of the time was ‘ See if it fixed by the new alpha/beta version of a software’ and it seemed Ubuntu or Canonical was more interested in patching only paying customer issues. Even if a large number of people had the same issue, they would bump it to Debian or/and upstream. Digging further, asking some of the Canonical employees they would tell/share that they didn’t have enough manpower which is true. Another couple of things that people might not know is that most Canonical employees had/poached were Debian volunteers when Canonical was started. Unlike Google which has this 20% off-time where the company pays for doing your hobby projects don’t think Canonical has that. I would be glad to be proved wrong if it so. So while there are Canonical employees who do Debian work, they usually do it in their own free time and nobody is paying them for that. What has also not helped Canonical and probably Google realized later than sooner was that was the Contributor License which stopped upstreaming of patches, bug fixes from Canonical to Debian. At the end there may be a variety of factors for e.g. Debian has much resources, the mirror and autobuilder network, the number of packages and architecture support, 50k+ and 13-14 architectures, number of architectures grows and declines every couple of years depending on the motivation of the developers/porters . Porting for a particular architecture is probably not for the weak of the heart. There also might be some understandings and some policy initiatives which might have made Google part ways with Ubuntu and be more closely attuned to Debian. From google’s perspective it seems a good move as the amount of retraining needed to do will be minimal. The only changes they would have to do is reset the headers which probably the google employees/Debian volunteers will do on company time and be more happy. There may be some more employees coming from Debian to join Google. You can derive that from the number of GSOC seats that Google gives to Debian every year, barring last year as we wanted to focus more on releasing Debian. There are just too many unknowns to guess but do think it will be far better, richer both for Debian as red-tape is minimal in Debian as its a volunteer organization. That might also drive down costs.